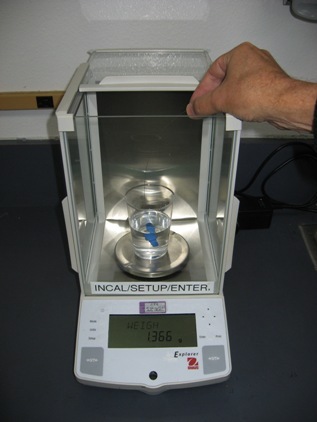 The standard method for finding Specific Gravity is to weigh the part in air, then weigh the part in water, then use a formula I can never remember. That method is difficult to set up with the type of balance shown, and impossible to use if the part floats, so we'll use a much easier method that I've developed. The formula for density is then mass/volume which I can always remember. First find the mass of the part with the analytical balance. Next, find the volume of the part. 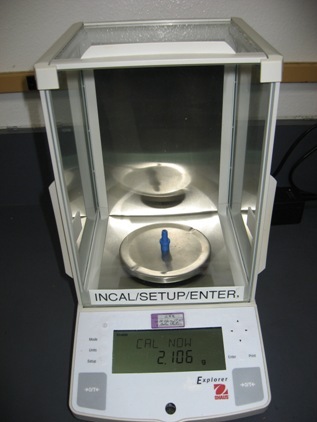 Place a beaker of water on the balance, tare the reading to zero, and hold the part under water using a thin wire. Hold it still, do not let it touch the sides or bottom, and make sure no bubbles are sticking to the part. (If bubbles are a problem, remove the area where the bubbles are sticking and start over). It does not matter whether the part wants to float or not, hold it under water with the wire. There is now an upward buoyant force on the part which is equal to the weight of the water displaced by the part. The numerical value of this weight in grams is equal to the volume in ml. The balance will display the buoyant force in grams. Density is then the weight of the part divided by the buoyant force. Since one ml of water weighs one gram, the specific gravity and density are the same.